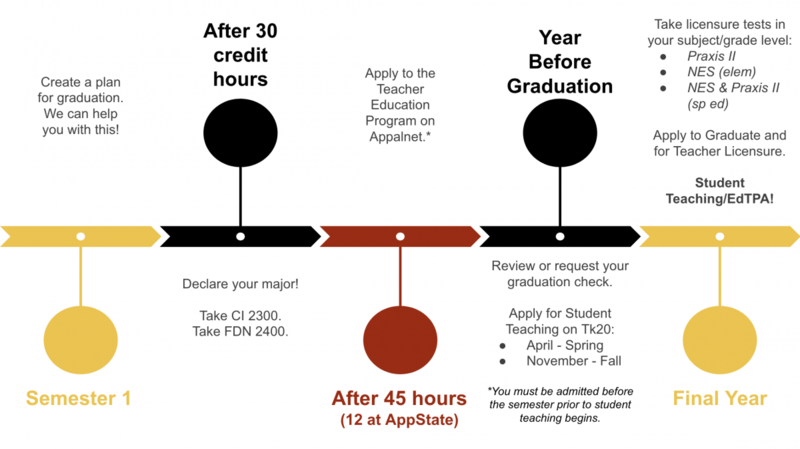 Create a graduation plan. You should map out when you will complete all of your coursework, as well as when you will complete all of your graduation requirements. You can do this with the help of your advisor or a James Center staff member. This could save you time and money! Declare your major. This will mean you will get a new advisor in your discipline. You can also register to take CI 2300 and FDN 2400, both of which are required for admission to Teacher Education with a grade of C or better. You must also attend a First Steps to Teaching orientation. Apply to Teacher Education. You will do this on appalnet. You can find instructions here as well as the requirements you must have done in order to apply. You must be admitted before starting Block I or before the semester prior to student teaching begins. Do not wait this long! Apply as early as possible. You must apply for Student Teaching a year before you plan to student teach. You will do this on Tk20. You can find more instructions here. This application is only open for one month during the semester you must apply (April for Spring student teachers and November for Fall student teachers). Review or request your graduation check. Make sure you are on track to graduate and that all of your coursework is recorded correctly! If you keep up with your Degreeworks, there shouldn't be any surprises. You must be admitted to teacher education before this semester begins. Apply to graduate and apply for International Student Teaching (optional). You must complete licensure tests (NES, Praxis II, etc.) and edTPA before the end of your clinical internship. You will then apply for your North Carolina teaching license.